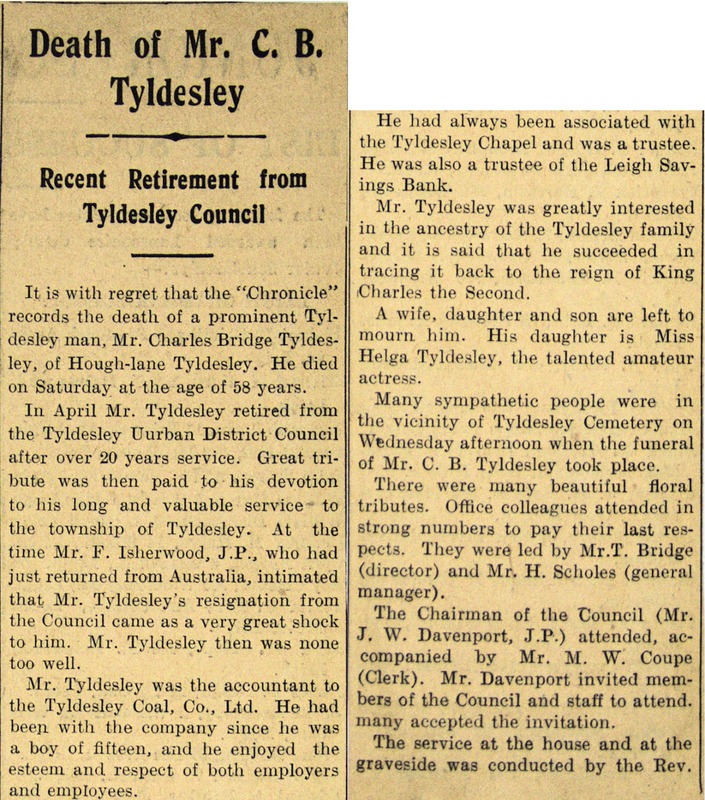 It is with regret that the "Chronicle" records the death of a prominent Tyldesley man, Mr. Charles Bridge Tyldesley, of Hough-lane Tyldesley. He died on Saturday at the age of 58 years. In April Mr. Tyldesley retired from the Tyldesley Urban District Council after over 20 years service. Great tribute was then paid to his devotion to his long and valuable service to the township of Tyldesley. At the time Mr. F. Isherwood, J.P., who had just returned from Australia, intimated that Mr. Tyldesley's resignation from the Council came as a very great shock to him. Mr. Tyldesley then was none too well. 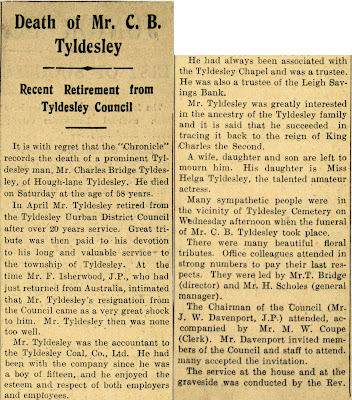 Mr. Tyldesley was the accountant to the Tyldesley Coal, Co., Ltd. He had been with the company since he was a boy of fifteen, and he enjoyed the esteem and respect of both employers and employees. He had always been associated with the Tyldesley Chapel and was a trustee. He was also a trustee of the Leigh Savings Bank. Mr. Tyldesley was greatly interested in the ancestry of the Tyldesley family and it is said that he succeeded in tracing it back to the reign of King Charles the Second. A wife, daughter and son are left to mourn him. His daughter is Miss Helga Tyldesley, the talented amateur actress. Many sympathetic people were in the vicinity of Tyldesley Cemetery on Wednesday afternoon when the funeral of Mr. C. B. Tyldesley took place. There were many beautiful floral tributes. Office colleagues attended in strong numbers to pay their last respects. They were led by Mr.T. Bridge (director) and Mr. H. Scholes (general manager). The Chairman of the Council (Mr. J. W. Davenport, J.P.) attended, accompanied by Mr. M. W. Coupe (Clerk). Mr. Davenport invited members of the Council and staff to attend, many accepted the invitation. The service at the house and at the graveside was conducted by the Rev.